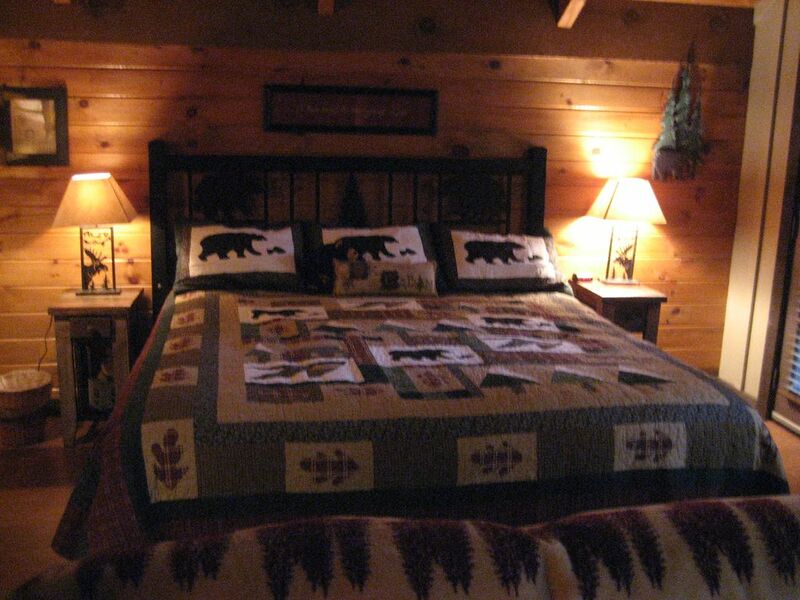 Bearly BeeHaven is a 1 bedroom luxury cabin secluded on Hidden Mountain West. Owners had been vacationing in this area for 20 years and decided to relocate to this area from Birmingham, Alabama in 2012. We love the mountains and the serenity we have found here. 'Bearly BeeHaven' is a dream come true !!! 'Bearly BeeHaven' is located in the center of all attractions of Pigeon Forge, Gatlinburg and the Great Smoky Mountains National Park. We purchased this cabin as a rental in hopes others can visit, explore and find peace and happiness as we have found here in East Tennessee. It has been good for our souls. Can you say COZY ???? 'Bearly BeeHaven' has country charm as well as luxury only minutes away from dining and outlet malls. Some attractions including 'The Island' features live music and fine dining along with a very large Ferris wheel that you can ride and see the parkway from a birds eye view. Margarita-ville is scheduled to open in 2014. Go carts, miniature golf and old time photo shops line the streets of Pigeon Forge and Gatlinburg for a time to be remembered. Country décor bathroom with shower/tub combo. local and long distance phone service provided. Dinning area located inside a beautiful bay window with a gorgeous view of the trees. Bearly BeeHaven is a quiet, secluded, very romantic getaway for newlyweds, honeymooners, anniversaries or just in love couples wanting to get away from everyday life. Great little cabin, perfect location for exploring the Smokey’s. The cabin is very clean and decorated so cute. The hot tub is great and bed very comfortable. Owners are super friendly and helpful. We enjoyed our stay. The cabin was clean and perfect for a couples get away. It only takes a few minutes to get to the Parkway, where there are a ton of restaurants and things to do. We hope to stay at this cabin again in the near future. My husband and I truly enjoyed ourselves at this cozy little cabin, Bearly Beehaven. Tonjia and Mickey were gracious hosts and made sure we had all questions answered. The cabin was perfect for us. We sat on the back deck listening to music, cooked and ate all of our meals there, went for walks around the neighborhood, and enjoyed the hot tub. We absolutely positively loved our time there. Thank-you Tonija and Mickey for a wonderful vacation. We really enjoyed your beautiful cabin and your gracious southern hospitality. Your cabin makes one feel right at home with all its amenities and we are recommending it to anyone who is visiting the Pigeon Forge Area. This cabin was perfect for our long weekend getaway! It was our second visit and certainly won’t be our last! Everything from the hospitality of the Fetterolf’s to the tiniest attention to detail was beyond what you could ever expect! We had everything we needed for our perfect weekend! Can’t wait to be back again! You will only be minutes from all attractions in Pigeon Forge including Dolly Parton's Dollywood Theme Park, Slash Country Water Park, miniature golf courses. Enjoy go-cart tracks, dinner theaters, and for the risk taker Pigeon Forge offers bungee jumping and zip lines. If you enjoy shopping, there are 3 outlet malls and several unique shops to find gifts for everyone on your list. Pigeon Forge offers many great restaurants for your dining pleasure. Downtown Gatlinburg is located within 15 minutes from Pigeon Forge for other shopping and dining options. If you are looking for that unusual gift, Gatlinburg is the place to find it. Take some time and enjoy the Great Smoky Mountains National Park. There you will find over 800 miles of hiking trails, many with beautiful waterfalls, wildlife and breathtaking mountain views. Take a picnic basket and enjoy an afternoon at one of the several picnic locations available in the park.